The Liquid Crystal Display Types are one of the most fascinating material systems in nature, having properties of liquids as well as of a solid crystal. The terms liquid crystal refers to the fact that these compounds have a crystalline arrangement of molecules, yet they flow like a liquid. Liquid crystal displays do not emit or generate light, but rather alter externally generated illumination. Their ability to modulate light when electrical signal is applied has made them very useful in flat panel display technology. Fig. 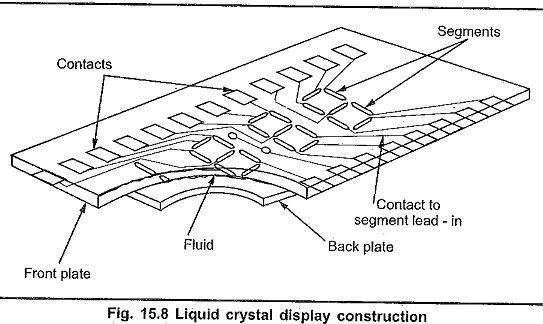 15.8 shows the construction of a typical Liquid Crystal Display Types. It consists of two glass plates with a liquid crystal fluid in between. The back plate is coated with thin transparent layer of conductive material, where as front plate has a photoetched conductive coating with seven segment pattern as shown in Fig. 15.8. In the absence of the electrical signal, orientation order is maintained in the crystal allowing light to transmit. This makes LCD display clear. The current through the liquid crystal causes orientation order to collapse. The random orientation results scattering of light which lights display segment on a dark background. Fig. 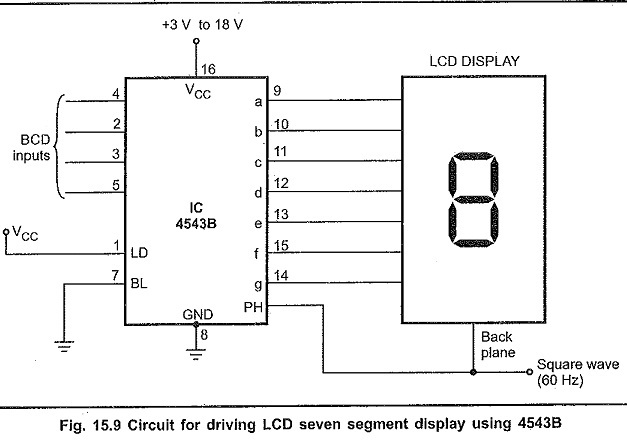 15.9 shows the circuit for driving LCD seven segment display using IC 4543 B. 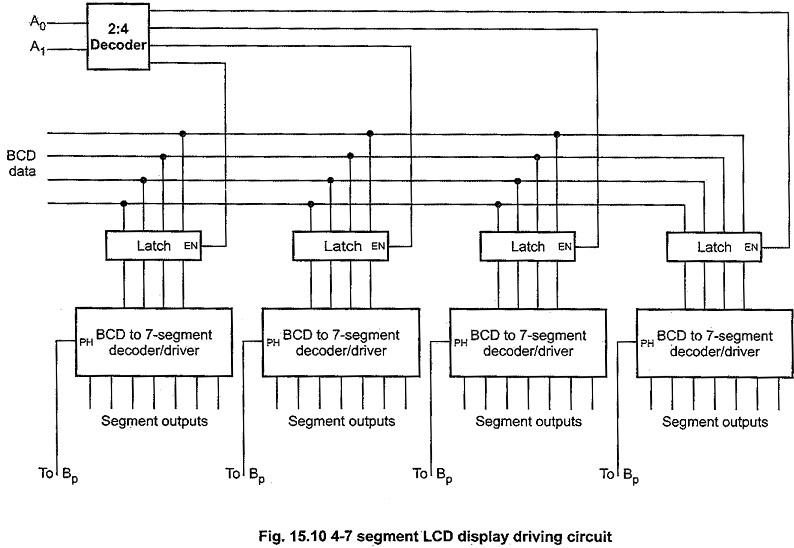 The 4543B BCD-to-7 segment latch/decoder/driver is designed for Liquid Crystal Display Types. Pins A, B, C and D represent BCD inputs with A as a least significant bit (LSB) and D as a most significant bit (MSB). Pins a through g are the seven segment outputs. The 4543 B has three control terminals : LD (Latch Disable), PH (Phase), and BL (Blank). In normal use the LD terminal is held high and BL terminal is tied low. The state of the PH terminal depends on the type of display that is being driven. For driving LCD displays, a square wave (about 60 Hz. swinging fully between the GND and VCC values) must be applied to the phase terminal. The display can be blanked by simply driving the BL terminal to the logic high state. When the LD terminal is in its normal high state, BCD inputs are decoded and fed directly to the seven segment output terminals of the IC. When the LD terminal is pulled low, the BCD input signals that are present at the moment of transition are latched into memory and fed to the seven segment outputs. The Fig. 15.10 shows how above circuit can be used to drive a 4-digit norunultiplexed, 7-segment LCD display. Here, BCD input for each display is latched in the corresponding latch. The latch enable signals are activated using 2 : 4 decoder in synchronisation with the BCD inputs. Now-a-days, many LCD modules are available which has build-in drivers for LCD and interfacing circuitry to interface them to microprocessor systems. These LCD modules allow display of characters as well as numbers. They are available, in 16 x 2, 20 x 1, 20 x 2, 20 x 4 and 40 x 2 sizes. The first figure represents number of character in each line and second figure represents number of lines the display has. 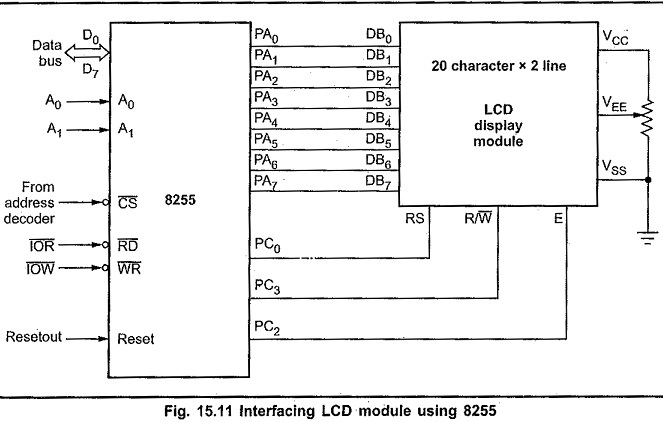 In this section, we see the interfacing of 20 x 2 LCD display module to microprocessor system through 8255. In this module the display is organized as two lines, each of 20 characters. The module has 14-pins. 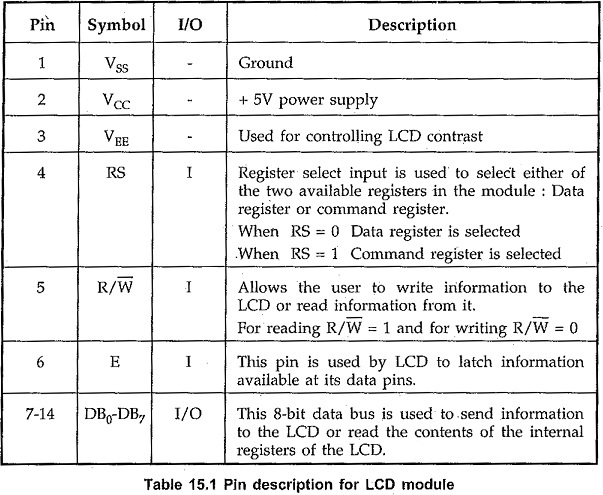 The function of each pin is given in the table 15.1. The Fig. 15.11 shows the interfacing of a 20 character x 2-line LCD module using the 8255. As shown in the Fig. 15.11, the data lines are connected to the port A of 8255 and control lines RS, R/W and E are driven by PC0, PC1 and PC2 lines of port C, respectively. The voltage at VEE pin is adjusted by a potentiometer to adjust the contrast of the LCD. The display can be controlled by issuing proper commands to the LCD module. 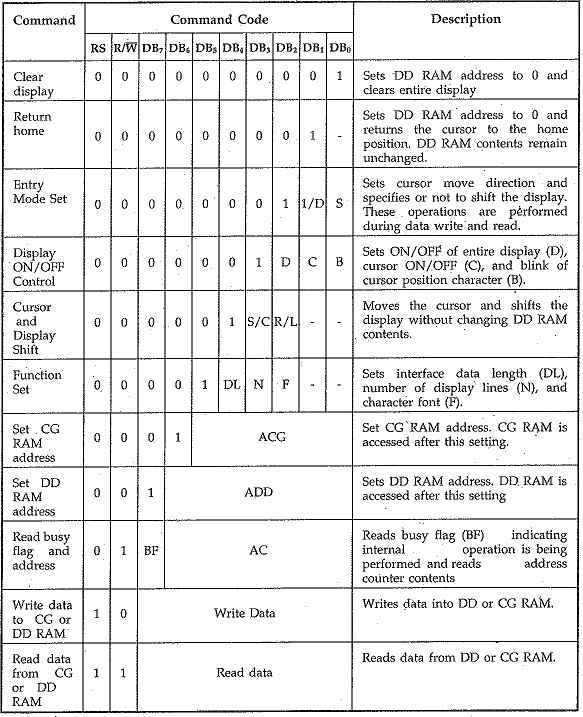 The table 15.2 lists the command available for LCD module. To display a message on LCD module, it is necessary to initialize it by writing series of command codes in the command register in a proper, sequence. The initialization includes command codes for clearing the display, returning the cursor home, and shifting cursor automatically after writing a character. After initialization we can write data to either DD RAM or CG RAM. Both RAMs ale read/write RAMs and has unique addresses to access each location. To write data in any RAM we have to set the address for that RAM by issuing proper command. Then we can write data into it by activating write cycle. To activate write cycle we have to make R/W signal low, RS signal high, send data on port A and apply high to low pulse of at least 450 ns of duration on E pin of the module. The DD RAM stores the characters in their ASCII code whereas CG RAM stores the character in its internally generated character code. Let us see the 8085 assembly language program to display ‘WELCOME’ message on the LCD module.